Agra is a city on the banks of river Yamuna in the northern side of Uttar Pradesh. It is home to most beautiful Taj Mahal, a mausoleum built for Mughal ruler Shah Jahan’s wife Mumtaz Mahal, who died during 1631. It is major tourist destination because of its Mughal-era monuments, three of which are counted between UNESCO World Heritage Sites. Taj Mahal is regarded as best Mughal architecture and was winner of Seven Wonders of the World during 2007. This was built for his most beloved wife and took 22 years to totally get completed with 20,000 workers employed under the guidance of Ustad Ahmad Lahauri. Agra Fort is another World Heritage Site; this fort stood since 11th century but was renovated by Akbar with red sandstone during 1573. This fort has been transferred between many empires like Mughals, Marathas and British and many battles have been fought over it. Tomb of I’timad-ud-Daulah is a complete draft of Taj Mahal or Baby Taj. It was commissioned by Nur Jahan, the wife of Jahangir for her Persian father Amir who was in exile. The Mehtab Garden is one among eleven Mughal Gardens, situated along the banks of Yamuna, opposite to Taj Mahal and Agra Fort. 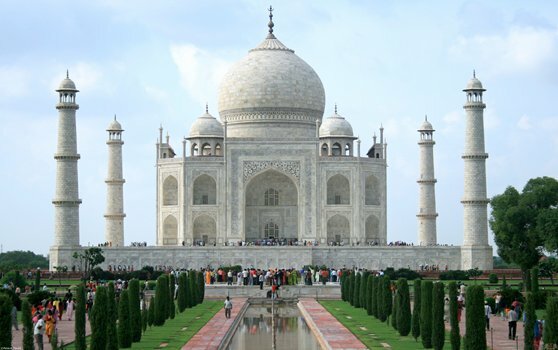 A tomb of Mumtaz Mahal was found while excavating Mehtab Bagh. Akbar himself planned his tomb and after his death his son Jahangir fulfilled his wish by constructing Akbar’s Tomb in 1613. His body was situated at this tomb long ago before it was looted and burned for gold. Moti Masjid earned the epithet Pearl Mosque because of its pearl like appearance. It was constructed by Shah Jahan especially for his royal court members. Jama Masjid in Agra was again built by Shah Jahan for his beloved daughter Jahanara Begum lying opposite to Agra Fort. Agra is famous for Mughlai dishes and its petha. Check out Fatebad road, Sadar bazar and Belanganj. For petha try Panchi petha store in Sadar. Some famous street markets are Raja ki Mandi, Sadar Bazar and Subhash Bazar near Jama Masjid. General weather of this destination is Varies. This destination is of type City.